We’d love your help. Let us know what’s wrong with this preview of Another Day as Emily by Eileen Spinelli. To ask other readers questions about Another Day as Emily, please sign up. Suzy is having a hard time. Her four year old brother is a local hero, having saved their neighbor by calling 911. She feels invisible, and it just gets worse when her best friend gets a role in a community play, and Suzy does not. She finds solace in Emily Dickinson, and decides that she will be just like Emily - a poet and a recluse. The events in this middle grade book aren't tragic or heartbreaking, but I'm fine with that. Suzy is a realistic eleven year old jealous of her brother, trying to Suzy is having a hard time. Her four year old brother is a local hero, having saved their neighbor by calling 911. She feels invisible, and it just gets worse when her best friend gets a role in a community play, and Suzy does not. She finds solace in Emily Dickinson, and decides that she will be just like Emily - a poet and a recluse. The events in this middle grade book aren't tragic or heartbreaking, but I'm fine with that. Suzy is a realistic eleven year old jealous of her brother, trying to find an identity that isn't overshadowed by family and friends. I liked her relationship with her next door neighbor, who is particularly sensitive to Suzy's plight for identity. Her family is also largely supportive, which is a nice change in kid's literature. Another Day as Emily is a new work in free verse by Eileen Spinelli. I fell in love with Spinelli's work when I read Where I Live and The Dancing Pancake and I was excited to see a new book by this author on the shelf at the library. I was not disappointed. Another Day as Emily is told from Suzy's point of view. Suzy is 11 years old. Her younger brother makes a 911 call when he finds their next door neighbor collapsed on the floor and is proclaimed a local hero--complete with a homemade cape and Another Day as Emily is a new work in free verse by Eileen Spinelli. I fell in love with Spinelli's work when I read Where I Live and The Dancing Pancake and I was excited to see a new book by this author on the shelf at the library. I was not disappointed. Another Day as Emily is told from Suzy's point of view. Suzy is 11 years old. Her younger brother makes a 911 call when he finds their next door neighbor collapsed on the floor and is proclaimed a local hero--complete with a homemade cape and his name in the newspaper. At first Suzy joins her parents and neighborhood in their "Isn't he sweet and SO smart" attitude toward her brother. She quickly loses her enthusiasm and tolerance for his new popularity. To Suzy, the attention focused on her brother starts to feel like an ABSENCE of attention for her. When one of his new "hero" antics causes Suzy to miss out on the birthday trip she and her father have planned AND she loses out on another special event with her best friend Suzy feels crushed by her disappointments and abandoned by her parents in favor of her "hero" brother. When the unfairness of her life overwhelms her Suzy decides to exchange her life for that of Emily Dickinson's (to whose life and works she has been introduced through a Summer Program at the Library). Referring to her own research Suzy compiles a list of the things Emily was most likely to do...and NOT do. Baseball, one of Suzy's passions, was not of interest to Emily Dickinson; she communicated only through written letters; she cleaned and baked; she would sometimes lower a basket of homemade gingerbread for the neighbor children. On occasion she DID visit her sister-in-law next door, but otherwise remained hidden in her home wearing mostly white dresses. Suzy makes a sincere attempt to imitate Dickinson's life...to the point where her parents don't think THEY can take it anymore. In the process Suzy (predictably) discovers the people, the love, the friendships in her own life which persist even when it feels like they do not. Another Day as Emily is an easy read whose greatest appeal will be to young girls from about 8-12 yrs of age. As emotions and life circumstance start to play larger roles in our lives we naturally look to those around us for clues on how to handle those situations. Suzy finds that in her neighbor, her parents and her best friend and readers can find it in Suzy herself. In this novel in verse, Suzy is miffed because her younger brother gets all the glory for calling 911 when Suzy's friend and neighbor, the elderly Mrs. Harden, collapses. Suzy stayed and held her hand, but no one cares about that. Suzy isn't getting along all that well with her friend Allison, and after Suzy is assigned Emily Dickinson for a summer project, she takes her research one step further and starts to try to be a recluse like Dickinson, not seeing anyone and trying to wear all white dre In this novel in verse, Suzy is miffed because her younger brother gets all the glory for calling 911 when Suzy's friend and neighbor, the elderly Mrs. Harden, collapses. Suzy stayed and held her hand, but no one cares about that. Suzy isn't getting along all that well with her friend Allison, and after Suzy is assigned Emily Dickinson for a summer project, she takes her research one step further and starts to try to be a recluse like Dickinson, not seeing anyone and trying to wear all white dresses. This is harder than she thinks it will be, but in the end, she figures out what is important in life. Strengths: This might be just the ticket for fourth grade girls who are obsessed with Emily Dickinson and who are fighting with their friends and hate their families. The emotions are all spot-on for the younger age group, and the illustrations are nice. I like Suzy's relationship with Mrs. Harden. Maybe I'm not fair to this book, because I'm irritated that the description and title don't (for me) match what this book really is, and my annoyance is out of proportion. There's nothing so very wrong with it. People are always saying that novels in verse are just books with weird line breaks, and most of the time I don't think that's valid (whether I like the book or not), but here I think it really IS. (I had a wait-a-moment feeling early on and thought "maybe this is written in Dickinson com Maybe I'm not fair to this book, because I'm irritated that the description and title don't (for me) match what this book really is, and my annoyance is out of proportion. There's nothing so very wrong with it. People are always saying that novels in verse are just books with weird line breaks, and most of the time I don't think that's valid (whether I like the book or not), but here I think it really IS. (I had a wait-a-moment feeling early on and thought "maybe this is written in Dickinson common meter, 'cause that would be remarkable"--but it isn't.) But anyway, there's nothing to signify from the outside that this is verse, and both description and title are misleading--Emily Dickinson isn't mentioned until almost halfway through, and the actual part where she's trying to live like Emily Dickinson takes up only a small part of the narrative. That concept was why I picked up the book at all. Kind of hard to read: it's written in verse! This middle grade novel is written in a style that is quick and easy to read. The chapters are very short, going from thought to thought and experience of the main character, Suzy. She's a 12-year-old who becomes very disgruntled about how her life is going, feeling slighted and disappointed, so when she learns about Emily Dickinson she decides to become a recluse the way she did. It was harder than Suzy expected. Young readers will be able to relate to this story which is told from Suzy's persp This middle grade novel is written in a style that is quick and easy to read. The chapters are very short, going from thought to thought and experience of the main character, Suzy. She's a 12-year-old who becomes very disgruntled about how her life is going, feeling slighted and disappointed, so when she learns about Emily Dickinson she decides to become a recluse the way she did. It was harder than Suzy expected. Young readers will be able to relate to this story which is told from Suzy's perspective. Suzy, the protagonist of Eileen Spinelli’s latest middle grade novel in verse, is having a difficult summer. Her younger brother has had a recent rise to fame after calling 911 for an ill neighbor, making Suzy feel excluded, and her best friend would rather audition for a play than participate in the public library's tween summer program. Suzy is also worried about Gilbert, a boy she might like, who has been accused of stealing. When Suzy learns about Emily Dickinson through the library program, Suzy, the protagonist of Eileen Spinelli’s latest middle grade novel in verse, is having a difficult summer. Her younger brother has had a recent rise to fame after calling 911 for an ill neighbor, making Suzy feel excluded, and her best friend would rather audition for a play than participate in the public library's tween summer program. Suzy is also worried about Gilbert, a boy she might like, who has been accused of stealing. When Suzy learns about Emily Dickinson through the library program, she decides that she will be a recluse just like Emily and avoid all the socialization that makes her life so complicated. Unfortunately, being Emily comes with unexpected complications of its own. This character-driven story is Spinelli’s best novel in verse to date. The poetry is evocative, using just the right details to describe how it truly feels to be eleven years old. The free verse format makes it possible to include little moments of observation about Suzy’s life that provide fun and interesting insights into her world and personality, and make it easy for the reader to empathize with her changing feelings throughout the book. Though introspective plots often make for slow reads, this story moves along at a fast pace and can easily be finished by strong readers in just a couple of hours. Though the title suggests that Emily Dickinson is a major part of this book, her involvement is really secondary and familiarity with her work is not necessary to understand Suzy’s desire to disconnect from the outside world. Not many kids seems to be huge Dickinson readers, but it is possible that some would become interested after reading this book. At the very least, this book would set them up to recognize some of her poetry when it eventually shows up in their classrooms. Suzy is a great kid. She cares about her family and neighbors and likes to help them out. She is just starting to get interested in a boy and is as supportive as she knows how to be when he is accused of doing something wrong. She shares her greatest interests with her friend and shares her friends' interest as well. Her life is really pretty good--until, that is, her little brother, Parker, becomes a hero for calling 911 when she collapses while getting him a cookie. Suzy comes into the house a Suzy is a great kid. She cares about her family and neighbors and likes to help them out. She is just starting to get interested in a boy and is as supportive as she knows how to be when he is accused of doing something wrong. She shares her greatest interests with her friend and shares her friends' interest as well. Her life is really pretty good--until, that is, her little brother, Parker, becomes a hero for calling 911 when she collapses while getting him a cookie. Suzy comes into the house as Parker is yelling "emergency!" into the phone. Suzy stays with the neighbor providing her comfort and assistance until the ambulance arrives. Parker becomes the local hero when the story of his call gets made public. Suddenly, all the attention is on him. Initially Suzy understands why others think Parker is a hero and give him so much attention, but it seems to go on forever! Then, one day, she reads about the poet Emily Dickinson and decides maybe the best way to make her life better is to emulate Emily and become a recluse herself. I think everyone has had times when they are conflicted with anger or a tinge of jealousy about someone they really care about as a friend or family member. It's hard to deal with those times. Suzy finds that by "becoming" Emily, she doesn't have to think about it. Of course, she also discovers that becoming Emily takes away some of the good things about being Suzy. The story is told in verse. It could definitely be stronger, I think. The author has chosen to write in free verse, but she doesn't always use the best imagery to convey her meanings. Too many sections read like prose broken into random short lines. It would, however, make an interesting starting point to talk about the challenges of writing poetry. Suzy, her younger brother Parker, and their parents have a normal life, until Parker becomes the "little hero" of the neighborhood. Suzy then feels like she is not noticed and becomes the black sheep of the family. She feels a lot like the famous poet Emily Dickinson who she is learning about in her book club, and she even begins to act like Emily. She won't come out of her room, she refuses to talk to her family and friends, she dresses in white everyday like Emily and changes her name to "Emily." This is a very quick and interesting read because you get to experience the life and times of Emily Dickinson in a short fiction book and many plot lines are brought together to make the story an intriguing read. Summary: Tween Suzy Quinn is having a trying summer – she misses her mother who is out of town taking care of her grandmother; her little brother, Parker, calls 911 when a neighbor is ill and is proclaimed as a hero; Suzy and her best friend, Alison, try out for parts in a play. Suzy adores her young brother so she is torn by the jealousy she feels toward all the attention he is receiving while feeling no one is paying attention to her. Finally when Parker “ruins” her birthday she decides to become a recluse like Emily Dickinson. Recommendation or Comments: I found the discrepancies between the narrative and the illustrations disconcerting. I enjoyed the story but was not fond of the format and writing style of the book. First sentence: Mrs. Harden nearly died today. Premise/plot: Suzy, the heroine, becomes jealous of her younger brother, Parker, when he saves Mrs. Harden's life by calling 911 and becoming the town's "little hero." The situation continues perhaps because Suzy's mom can't resist supporting, encouraging, enabling the hero-complex--cape and all. Suzy's friend, Alison, is good for her, for the most part. But Alison doesn't love to read, and, doesn't really enjoy going to the library for tween-time. S First sentence: Mrs. Harden nearly died today. Premise/plot: Suzy, the heroine, becomes jealous of her younger brother, Parker, when he saves Mrs. Harden's life by calling 911 and becoming the town's "little hero." The situation continues perhaps because Suzy's mom can't resist supporting, encouraging, enabling the hero-complex--cape and all. Suzy's friend, Alison, is good for her, for the most part. But Alison doesn't love to read, and, doesn't really enjoy going to the library for tween-time. Suzy, likewise, doesn't really want to be an actor and audition for a play--but she does anyway. So--perhaps unrealistically--the library's tween program meets weekly (or even several times a week?) and has a theme of the 1800s. This library program has homework too. And not even reading club type homework--reading and discussing the same book. Suzy's project is Emily Dickinson. And in light of failure--as she sees it, she did not get a part in the play--she decides to become a recluse for the summer. She only wants to be called Emily; she only wants to dress in white; she will no longer do technology. This phase is worrying to her parents and friends. Will Suzy ever want to be Suzy again? I enjoy fiction about literary persons so I was intrigued by the reviews of two juvenile titles involving Emily Dickinson. See those New York Times reviews here: http://nyti.ms/1guT188. Another Day as Emily by Eileen Spinelli is written for the 9-12 female audience, featuring the spunky Suzy, a tween who loves to read, is passionate about Phillie’s baseball, and just might be interested in her first boyfriend. Written in free verse, the novel captures the wonderful human relationships in the neig I enjoy fiction about literary persons so I was intrigued by the reviews of two juvenile titles involving Emily Dickinson. See those New York Times reviews here: http://nyti.ms/1guT188. 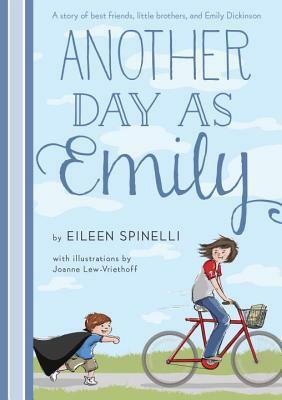 Another Day as Emily by Eileen Spinelli is written for the 9-12 female audience, featuring the spunky Suzy, a tween who loves to read, is passionate about Phillie’s baseball, and just might be interested in her first boyfriend. Written in free verse, the novel captures the wonderful human relationships in the neighborhood, the frustrations of sibling rivalry and gently looks at race relations. When Suzy becomes Emily for several days, those relationships are challenged and Suzy learns more about Emily Dickinson…and herself. Illustrations by Joanne Lew-Vriethoff add to this book’s enjoyment. Miss Emily, written by Burleigh Mutén and illustrated by Matt Phelan is also a verse novel. It takes as its premise that Miss Dickinson invites several Amherst children to sneak out at midnight and watch a circus train arrive. She assumes the name Prosperina, “Queen of the Night”; the children become Gypsies; adventures ensue. The plot line may be appealing to young boys as well as girls, providing an opportunity to introduce the K-3 set to Miss Dickinson’s naturalistic and minimalist verse. Both of these titles along with Dickinson’s selected poems would be suitable for both the classroom and an adult book discussion. Highly recommended. This is the kind of book you just fall into - two or three pages in and you are best friends with Suzy and 100% on side with her. Everything seems to make sense and it is that kind of instant alliance with a character that makes a book like this the perfect thing to give to a kid. I know this book would have been a re-reading choice when I was young and as soon as I was finished it I passed it on to my daughter because there was so much to like in Suzy. Now, it's not a warm and fuzzy read. Suzy i This is the kind of book you just fall into - two or three pages in and you are best friends with Suzy and 100% on side with her. Everything seems to make sense and it is that kind of instant alliance with a character that makes a book like this the perfect thing to give to a kid. I know this book would have been a re-reading choice when I was young and as soon as I was finished it I passed it on to my daughter because there was so much to like in Suzy. Now, it's not a warm and fuzzy read. Suzy is jealous of her little brother, she is stubborn when she loses out on a chance to celebrate her birthday with a baseball game in the city and she does develop an unusual fascination for Emily Dickinson but that dose of real life makes the book so delightful. Suze is the kind of girl you want to be or want to be friends with and the sweet illustrations in here - Joanne Lew-Vriethoff does something wonderful with a few simple lines - will draw in the readers. It's a long book but written in verse so the payoff is very high. This novel in verse starts out with Suzy's four year old brother calling 911 for the elderly neighbor, who has been taken ill. He's then lauded through the town as the "little hero," and Suzy is irritated and jealous. Then there's her best friend Alison, who seems less and less interested in what interests Suzy. The only bright spot in the summer is Gilbert, whom Suzy refuses to believe is a thief, and with whom she starts spending more time. But when she's rejected for a role in a local play, a This novel in verse starts out with Suzy's four year old brother calling 911 for the elderly neighbor, who has been taken ill. He's then lauded through the town as the "little hero," and Suzy is irritated and jealous. Then there's her best friend Alison, who seems less and less interested in what interests Suzy. The only bright spot in the summer is Gilbert, whom Suzy refuses to believe is a thief, and with whom she starts spending more time. But when she's rejected for a role in a local play, and Alison gets a part, Suzy feels completely isolated from her life, and decides to go whole hog and pull an Emily Dickinson and become a hermit. Suzy's little brother becomes a hero when he calls 911 for a neighbor. Suddenly Suzy is second fiddle in the family and Parker is getting all the attention. Suzy's and her best friend Alison are taking part in Tween Time at the library during the summer and learning about the 1800s. Suzy is also friends with Gilbert, a young man who does odd jobs around the neighborhood. Gilbert is accused of stealing from one of the neighbors, but Suzy is sure he didn't do it. When Suzy learns about Emily Dicki Suzy's little brother becomes a hero when he calls 911 for a neighbor. Suddenly Suzy is second fiddle in the family and Parker is getting all the attention. Suzy's and her best friend Alison are taking part in Tween Time at the library during the summer and learning about the 1800s. Suzy is also friends with Gilbert, a young man who does odd jobs around the neighborhood. Gilbert is accused of stealing from one of the neighbors, but Suzy is sure he didn't do it. When Suzy learns about Emily Dickinson at the library she decides that maybe it is time to give up being Suzy and start being Emily. She wears white dresses and becomes a recluse. However, being a recluse is hard work and Emily misses some of the things she did as Suzy. This is on our school district's reading list for 2017-2018 for 4th-6th graders (Called the MCBA Mash-up list for anyone local who might see this). My daughter decided she wanted to read it and we got it from the library through inter-library-loan. She started reading it in the car on the way home from the library and kept her nose in the book (putting off supper) until she was done with it. We ate dinner and then I picked it up and read through it until I was finished. So it's a quick and easy This is on our school district's reading list for 2017-2018 for 4th-6th graders (Called the MCBA Mash-up list for anyone local who might see this). My daughter decided she wanted to read it and we got it from the library through inter-library-loan. She started reading it in the car on the way home from the library and kept her nose in the book (putting off supper) until she was done with it. We ate dinner and then I picked it up and read through it until I was finished. So it's a quick and easy read but so much fun! You can read the other reviews for the spoilers but we are local to Amherst just about (it's where I work) and it's easy to imagine the scenery here as Suzy pretends to be Emily. In hindsight there was some foreshadowing of details that I missed because I didn't know anything about the book when I picked it up. I would read it again in a few months if I didn't have such a long to-read list already. This might end up being a favorite from the MCBA mash-up list. So fuN! This entire book is told in short poems, and I loved both the format and the lessons Suzy learns. Such a well-done story, it covers sweet and realistic heart-lessons about friendship, attention, dreams, disappointments, and being a big sister. Another Day as Emily would have been perfect for elementary-school-aged me, as I had a tendency to sulk after disappointments and also loved learning about historical figures. Written in poetry form, this book is about Suzy, a tween girl trying to find her place in the world. At the stage where she feels a little bit invisible when she wants to be noticed, and a little too noticeable when she wants to hide, Suzy is inspired by Emily Dickinson and lives a few days in her shoes. I enjoyed this book very much. Written in simple verse it tells the story of 12-year old Suzy's summer. She is sick and tired of the attention her younger brother is receiving for being a "hero." Through a summer library program she learns about Emily Dickinson, and decides to become her. Lots of fun, loved her voice, loved the characters--especially her relationship with her older neighbors. One thing I just can't understand is why Suzy would want to be in her room for so long instead of solving her problem. I do like that she is such a kind girl. I was really happy when she didn't blame Gilbert for stealing Mrs. Bagwell's ring like everyone else did. She didn't because she said there is no proof. Suzy reeky is a good charter. This review has been hidden because it contains spoilers. To view it, click here. I really liked this book, With this book I'm starting to like poetry because this book was funny,enjoyable. I also really like this book because she had a special relationship with her brother. For example when she got upset when her brother got lost and ended up at the police station she started crying. Suzy is enjoying a summer filled with dreams of baseball games, Tween time at the Library, riding her bike and becoming friends with a neighborhood boy. She learns about Emily Dickinson at Tween time and decides to take on Emily's persona only to learn that being Suzy is best of all. One star because it is written in verse and another star because it is about our local star, Miss Emily. I just love all of Eileen Spinelli's books. They just remind me of my childhood - simple, small town life. Reading this book just felt like crawling into my childhood bed with my favorite blanket fresh from the dryer - cozy and comforting. Like the main character, Suzy, I also had a fascination with Emily Dickinson - however, I didn't take it quite as far as she did, lol. I feel like writing in verse is all the rage right now. This book felt more like just short, choppy sentences. I think it will appeal to fourth/fifth girls who are dealing with some of the same emotions as Suzy--developing different interests than your best friend, starting to like a boy, annoying little brothers, etc. I thought it was just ok. This was a sweet story. I wanted to read it before buying it for my classroom, and now I'm still undecided if my students would love it. It's a quick read with simple prose, but a nice message. If I ever found it for a great price, I'd probably pick it up, but I won't be rushing out to look. I can think of a few girls who might enjoy it.